Howdy from a older newbie. This is my new project that replaces my 63 Chevy stepside that I had been driving for 20 years. I had a 76 LUV back in the 80's and thought I would give it another go. I couldn't pass up this one either. Purchased new by the grandfather, passed on the the grandson who then dropped in the 307 and t350 back in '88. Needless to say it need to be freshened up a tad and that is where I come in. It runs and drives doesn't smoke or leak that I can tell yet anyway. The most immediate problem is the stock rearend that I was told has 4:56 rear gears. That and the 14" 60 series rear tires makes 50mph a challenge. I have already found some great info here and will try and learn more as I go. You have a very nice truck! I like the "factory" look of the engine - with the OEM breather and exhaust manifolds. nice truck. I like it. I like the bed even more. at first i never like that bed. but lately I have been liking that bed. it would go great with the Ideas i got for my truck.......want to trade...... ..... . look forward to the refreshing of your luv. LUV is not just an emotion, its what you DRIVE. Nice truck. My LUV is a 72. I don't know if I want a bed swap but I'll keep it in mind. I got the pink slip in the mail today so I took it out for a cruise. I got about 2 blocks and lost the brakes completely. The left rear wheel cylinder let loose. Good thing walgreens has brake fluid. I pulled the drum off pushed the boot back onto the cylinder and bolted it up and limped it home. I consider myself lucky at this point. I bought a 3:42 carrier today and should have it on Friday so I'll fix it all at once. I had a nice full day of playing in the driveway today. I started out with a run to the hot rod swap meet in long beach where I picked up an arm load of goodies for the LUV. I did some rust rehab on the floors starting with brushing and scraping the loose rust away. then treating the rust with a rust remover/inhibitor. I followed that up with a coat of rustoleum satin black. I think the floors are still pretty good for now. I also spent a little time under the hood trying to figure out what I can take off. Does anyone know what the air cannister behind the battery is for? It has several vacuum lines going to it and I don't see it in the manual. I replaced the stock GM air cleaner since it was sitting on a Holley and didn' really fit. 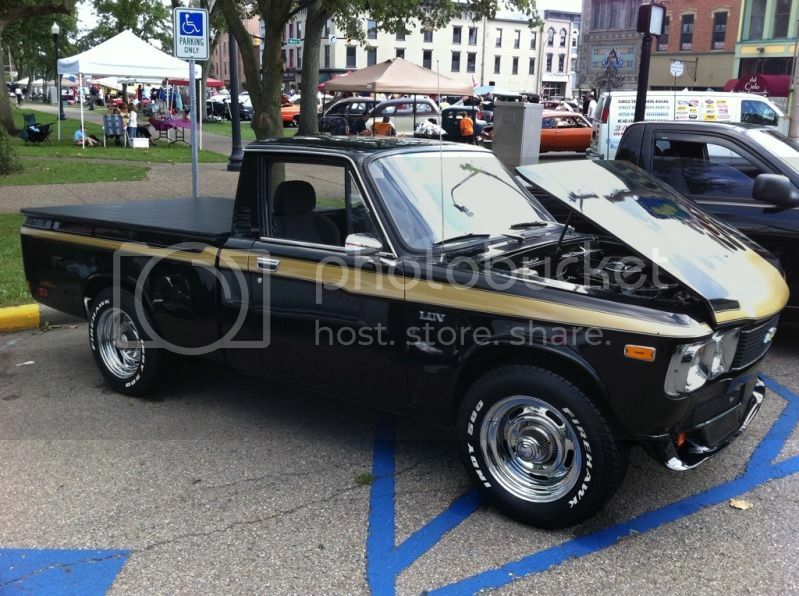 It is a weird model Holley too, so far I show it listed for a Dodge/Chrysler. It seems to work fine but the frankenstein linkage has to go. The time change gives me a few hours of light a night to play with the truck. Next up is the 3:42 install and 4 wheel brake job. That looks like alot of work will be needed, I will save you the trouble and come pick up the truck for $300.00 . Nice truck you have, I wish I could have started out with a truck like yours instead of one that was a step away from a basket case. Looks like more proof that we dont need to cut the firewall or core support to install a small block. The cannister behind the battery is a fuel evap system, looks like some one used this from the donor car. I would bet that some one tried to keep this smog legal whrn the swap was done. If it does not have it allready I would upgrade the front brakes to disc. 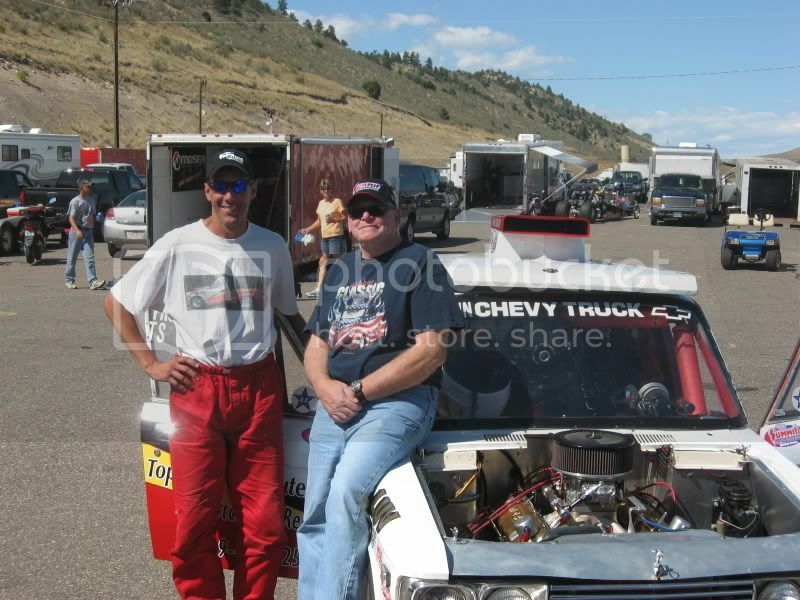 The motor was swapped in 88 and done legit per state guidelines. Now that it is off the books for the smog checks I want to remove everything that isn't needed under the hood. Steve the previous owner used an article in Truckin magazine to do the swap. It even has a stock mechanical fuel pump, which I didn't think would fit. I also have to rework the weak alternator bracket which was fabricated from scatch and looks like it. Disc brakes are on the list. Nice job, and nice truck. Another 72 guy, we're building up quite an army. Yeah you don't need fuel evap if you are not doing smog; but a small block can be smog legal if you keep all the equipment the engine originally had in the year it was made. Everyone please note that the small block fits just fine with exhaust manifolds. I know people are in love with headers but for all except out and out racing, I think manifolds work just fine and as you can see they fit. Nice truck, I see you are using the fan in front of the water pump most on here don't have enough room too run one like that what did you do different? Nice truck it reminds me of mine when i had the 283 in it. As for the fan i had one on mine all you need is the short water pump and pulleys. Well, I bought it like you see it. When I was working on the rusty floors I found a plate pop rivited along the front of the trans hump. I am guessing the firewall was cut into a bit. It was done just like the how to article on this site. They say you need a inch between the fan and radiator and I would say it is right at 1" at the most. The radiator was rebuilt as a 4 row too, but if it ever leaks a drop I will go with a new aluminium unit. 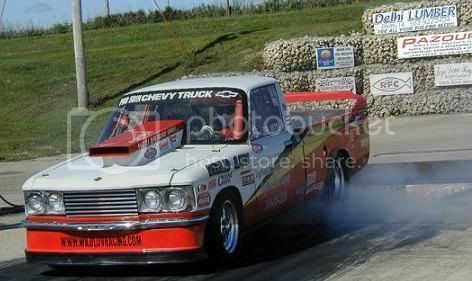 I am not going for an 8 second drag truck, I just want something to mess with the "tuners" heads. I suggest you keep the way under rated 307 in the truck and build on that in the future as those little motors are all most indestructible. If you are looking to get more out of it in the future there are plenty of stock chevy parts that will up the performance and not kill the drive-ability of the motor. I did a test patch on the cab b-pillar and you have to love single stage paint. You can abuse the hell out of it and with some elbow grease and the right polish it comes back pretty good. I also did the top half of the right front fender with really good results. Well I did a to get 12 hour wrench session today on the Luv. I power washed the differential and undercarriage last night to try and get most of the muck off. The seals were clearly blown in the old carrier as there was oil and grime everywhere. I started out pulling off 2 bolts for the carrier and then backed out one of the studs for reference. I shot over to pep boys and got 2 90mm bolts for the 81 carrier I picked up (2 bolt holes on the 81 carrier require longer bolts). Everything went pretty easy except breaking loose the old carrier, that took some work. My old unit was shot turning it felt gritty and was binding up. The new one was smooth. Here is where I freaked. Both ring gears had 41 teeth and when I turned to pinion it went 3.5 turns per full rotation of the gear. So I am thinking I got a 4:56 replacement not the 3:42 it was supposed to be. I was pissed, but I wasn't going to put that grinding carrier back in so I went on. It went together smooth and easy and after wrapping up the rearend I replaced both rear wheel cylinders and shoes cleaning everything along the way. After wrapping up the brakes I fire it up and go for a short cruise. Well its a 3:42 for sure I don't know how but it is. Before it would almost shift into 3rd by the time you crossed an intersection. Now it cruises nice shifts like a car is supposed to. I cruised around a bit and I am amazed at the driveability now. Honestly the 4:56 made it drive like a john deer and the top speed was probably 45 without making it scream. I was going between 45-50 and the tach was on 2k. I think I may keep the 14"s on it now its that much better. I think its a cake walk from here, everything else I want to do is easy stuff. 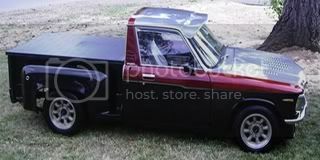 Here is a photoshop of what I want to do to the truck.